leaving only pure oxygen behind. Used Commercially - Keep everything fresh and clean smelling with the professional Chanson Miracle Sanitizer used by hotels to get rid of cigarette, mildew and other offensive odors. In Your Home or Office- Freshen your home, shoes, sports equipment, refrigerator, laundry room, litter box, garage or office. For Foods - It's also a powerful way to cleanse your fruits and vegetables from E. coli and other possible contaminants. and has hundreds of other uses. your wallet, and the environment! the manufacture says. The Miracle Sanitizer uses a quartz crystal tube which never wears out or needs to be replaced. In a room where mold, mildew or foul odors are prevalent, let the Miracle Sanitizer run for 10-20 minutes. May repeat if the room is large or odors are especially strong. Deodorize and sanitize shoes, toilet bowls, closets, cars, bathrooms, and refrigerators by placing the bubble stone attached to the Miracle Sanitizer in the desired space and ozonate for 10 minutes. Sterilize baby bottles, toys, daycare equipment, and hospitals. Clean and sanitize foods using the bubble stone in water. On June 26, 2001 the FDA approved activated oxygen for use in direct contact with food to kill food borne pathogens and is the most effective oxidizing anti-microbial agent known! It kills E-coli 3,125 times faster than chlorine, and it converts into ordinary oxygen in the process, leaving no chemical residuals behind. Activated Oxygen reacts with organic and inorganic substances neutralizing ammonia, ethylene and pesticides, thus enhancing the taste of food. There are no toxic by-products or health hazards when properly used as a micro biocide. The FDA and EPA certify activated oxygen (O3) as able to destroy 99.99% of pathogenic germs whilst destroying 99.99% pollutants simultaneously. For countertops and other surfaces: Place bubble stone in filtered water and ozonate water for 10 minutes (longer depending on the volume of water you are using). Pour water into a spray bottle to spray ozonated water onto surfaces and countertops for cleaning. Ozonated water will hold its antibacterial properties for 15 minutes. Fish Tanks: Place bubble stone in fish tank and ozonate for 10 minutes, or longer depending on the size of the tank. Sheets, Pillows and Mattresses: Place items in an airtight plastic bag with the bubble stone, seal the bag with the bubble stone inside and ozonate for 10 minutes. This will kill bedbugs, dust mites, bacteria, viruses, etc. Washing machine: Fill machine with water and drop the bubble stone in the water and let ozonate for 10 minutes. 10 minutes to kill bacteria and viruses. Ozonated water can be used in the treatment of body fungus such as Athletes Foot, Jock Itch and Ringworm. 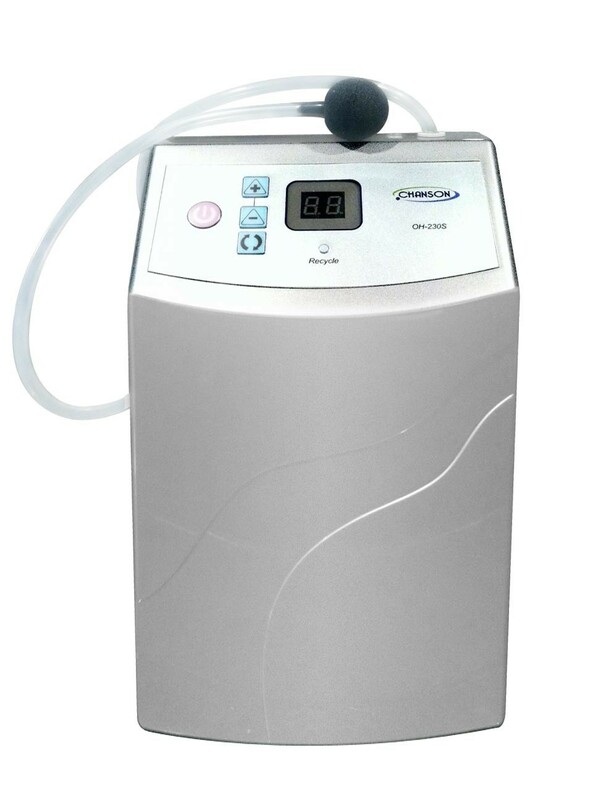 Ozonate purified water for 10 minutes and soak area with the fungus for 10 minutes, twice daily, until the fungus is gone. Ozonated water can also be used to rid surfaces (such as gym mats and equipment) that harbor the fungus. Simply using the Miracle Sanitizer for 10 minutes in the room on the surface where the fungus dwell, will also suffice. Can use to treat acne and other types of skin infections like bed sores, ulcers, etc. Activated Oxygen (O3) has been used in Europe for nearly 100 years to sanitize meat and dairy produce, glass jars for baby food, and is already being used commercially in the US to disinfect drinking water in over 250 municipalities, hospitals, kitchens, gyms, hot tubs, swimming pools, facial steamers, and the list goes on. On June 26, 2001 the FDA approved activated oxygen for use in direct contact with food to kill food borne pathogens and is the most effective oxidizing anti-microbial agent known! It kills E-coli 3,125 times faster than chlorine, and it converts into ordinary oxygen in the process, leaving no chemical residuals behind. Activated Oxygen reacts with organic and inorganic substances neutralizing ammonia, ethylene and pesticides, thus enhancing the taste of food. There are no toxic by-products or health hazards when properly used as a micro biocide. The FDA and EPA certify activated oxygen (O3) as able to destroy 99.99% of pathogenic germs whilst destroying 99.99% pollutants simultaneously. The Miracle Sanitizer is Mother Natures cleansing and detoxifying powers in a box! What pollutants are removed by the Miracle Sanitizer?